Have you ever been in the situation that you wanted to invest in a promising ICO but that the only way to join in the ICO is to sell a portion of your crypto holdings? We have been there and done that… Nexo.io promises us that that will no longer be necessary in the near future, why ? Read our review to find out! Nexo is founded by Credissimo who are also the majority shareholders of Nexo. Credissimo is a fintech company who provides short-term online financing solutions to consumers in emerging markets such as Bulgaria and Macedonia, but also in more developed markets across Europe. Credissimo AD was founded in 2007 and is based in Sofia, Bulgaria. Nexo is a crypto overdraft system that allows users to avoid selling their crypto holdings. You use your crypto holdings as a collateral by sending crypto assets to their overdraft wallet and then you will be able to instantly access cash denominated in fiat currencies such as USD, EUR, JPY. What Problems Does Nexo Bank Seek to Solve? Idle Value of Digital Assets: Investors around the world currently own digital and crypto assets worth billions of dollars that remain idle. There are major regulatory and infrastructure limitations that deter cryptocurrency owners to actually use crypto in their daily lives and take advantage of any immediate investment opportunities that require liquid cash or meet short-term obligations. 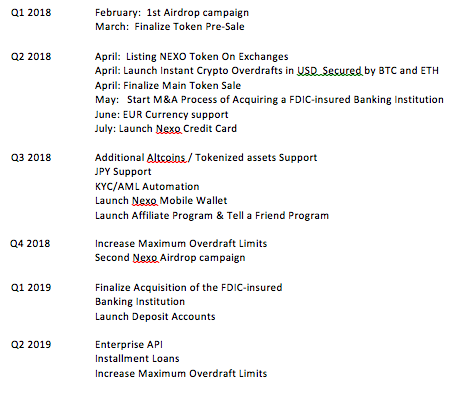 -Nexo overdraft wallet: Nexo aims to solve these problems by unlocking the value of digital assets, allowing clients to obtain an instant overdraft in fiat currencies or cryptocurrencies by placing their digital assets in an overdraft wallet. Crypto exchanges trade different digital assets and have different requirements, procedures and withdrawal limitations, which can slow down the liquidation process and be costly. Moreover, the clearing bank, which turns the digital asset into a fiat currency has its own procedures and fees that it transfers to the customer, adding costs and slowing down the whole process even further. -Quick Access to Cash: Nexo’s clients are able to receive cash instantly anywhere around the globe, seize investment opportunities and meet liquidity needs immediately. While withdrawing large amounts of cash is more conveniently done via bank transfers, Nexo’s retail clients have the option to use the free credit card for their day-to-day expenses . Loss of Ownership: In the current situation, owners of a digital asset have the limited option to sell their asset for fiat currencies which means they will loose ownership of the asset and any future price appreciation as well. –Retain Ownership: Clients retain 100% ownership of their digital assets. By making use of Nexo’s instant crypto overdraft, rather than selling they keep the whole capital gain and accompanying benefits from their digital assets. Nexo’s clients can enjoy their crypto wealth immediately, without having to sell their digital assets. Credit Checks: Hard credit checks are known to leave a mark on the credit score of the applicant. Hard checks lead to increased interest rates and often results in lower personal credit scores and higher interest rates on customer’s loans. What products are Nexo offering? Instant Crypto Overdraft: Clients have different financial needs and requirements, which is well understood and provisioned for by the Nexo Instant Crypto Overdraft. It is possible to receive instant crypto overdraft at the same/next day via bank transfer via SWIFT, SEPA or ACH to any bank account of the customer. Nexo Credit Card: Nexo is offering a Free creditcard with no hidden monthly/yearly fees, whereby the overdraft limits are based on the market value of the crypto assets in the overdraft wallet. Additional Credit is automatically and instantly available on the card upon appreciation of your crypto’s value. Nexo seeks to combine instant loans with blockchain technology, creating the world’s first instant crypto overdraft system. Users can enjoy their crypto wealth today without selling their crypto assets. Client repays overdraft: Clients can repay their flexible overdrafts in multiple ways . They have the option of making repayments via bank transfer, fiat or cryptocurrency. Special discounts on the interest rates will be granted to those choosing to make payments with NEXO tokens. A third option is to pay by partial sale of the crypto assets (BTC, ETH, etc . ) stored in the Overdraft Wallet. In addition to the flexible repayment options, Nexo does not require any monthly minimum repayments, as long as the outstanding balance is within the available overdraft limit . 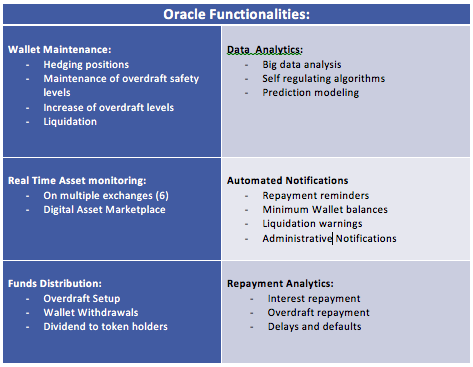 Once a repayment is received, the Nexo Oracle records the transaction on the blockchain and instantly updates the overdraft limits. What technology is behind Nexo? Automation of processes are at the core of Nexo’s business model, their system integrates all stages of the lending proces by having functionalities covering the period from loan application and disbursement to its servicing, full repayment, accounting and reporting. The Nexo smart contract will record the current outstanding balances of the client’s overdraft wallet. Interest will be accrued on on the utilized overdraft balances . Once clients repay their overdrafts or use more of their available limits Nexo will either credit or debit the balance and record the updates to the Ethereum blockchain. Nexo is founded by Credissimo who are also the majority shareholders of Nexo. Credissimo is a fintech company who provides short-term online financing solutions throughout Europe. The Nexo team currently consist of 14 people, we will now only name the most important ones. Kosta is a Co-Founder of Credissimo and the visionary directly responsible for the 10-year-old success story of the European FinTech Group. As an early adopter of bitcoin, he quickly realized the potential of blockchain technology, prompting him to develop one of the first systems to allow loan repayments in cryptocurrencies worldwide at Credissimo. Georgi comes from a background in banking, having gained substantial experience in fields like M&A and Financial Analysis at institutions such as Unicredit Bank Austria, Lehman Brothers, and the European Investment Bank. Overseeing the business development and international expansion of Credissimo has further solidified his FinTech expertise. . (Hopefuly his career at Lehman Brothers has showed him how not to conduct business)..
Vasil is an early blockchain technology adopter and has over 16 years of experience in system administration, back-end development and the architecture of high-load and full-cycle projects. He has co-founded a US multichannel video & internet service provider and distributor of interactive services who served more than 150 000 customers. The team has sought out advisors with extensive experience in their field such as Michael Arrington Founder of TechCrunch, Founder of Arrington XRP Capital and others. Click here for a full list of their team members and advisors. How are the NEXO tokens used? The NEXO Token is the world’s first US SEC-compliant dividend-paying asset-backed security token with additional utility features, that will be offered as a security to qualified investors in cordance with US and other laws. The NEXO Token is ERC20-compliant and embedded in the Ethereum blockchain as a smart contract. Dividend paying & Asset backed Token: NEXO Token holders will receive 30% dividends from Nexo’s profits. Dividends are paid monthly in ETH and distributed proportionately to all NEXO token holders, immediately when payment is sent to the dividend smart contract. Compiant and Regulated: NEXO Token complies with the US SEC rules and regulations pursuant to the US Securities Act Regulation D Rule 506(c). Interest Discount : The key utility feature of the NEXO token is the discount that token holders receive whenever they repay the interest on their overdrafts using the NEXO token. Increased Overdraft Limits: Similar to BTC and ETH, NEXO tokens can also be used in the Overdraft Wallet to obtain instant financing based on the tokens’ value. Nexo further incentivizes the use of NEXO tokens in the Wallet by offering discounts on the overdraft interest. 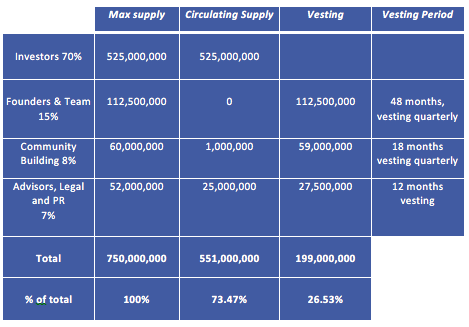 Huge market: The cryptocurrency market is expected to increase in value to 5 trillion by 2025, if Nexo serves only a small portion of this market, they will have a huge potential. Team: Nexo has a strong team that is rewarded with multiple European Fintech Industry awards and two forbes business awards for Financial Sector Innovations. They have a decisive edge on their competators because they they are building on top of their 10 year expertise in the financial markets, they do not try to re-invent the wheel, they are using their previous aquired knowledge and are applying that knowledge to blockchain technology to provide instant loans. There is no company yet that offers this. Working product: They have a working product and know exactly how to provide automated loans. Low entry barrier: Anyone can participate and apply for instant credit. There are no credit checks, only thing that is needed are crypto holdings. Their system is really easy to use and credit can be obtained nearly instantly. Volatility: We all saw Bitcoin crashing from 20K to nearly 6K this month. If for example your crypto holdings diminish in value of 50% and you just did an overdraft based on the 20K value, you might find yourself without a portfolio in a flash.. Core Technology Risks: Nexo is built with core technologies that are in some cases immature and unproven, including the Ethereum blockchain platform and various open source software applications and libraries. If those core technologies do not perform according to Nexo’s needs or expectations, they may be required to change the specifications and to reduce or eliminate features on the platform. Smart Contract risks: Certain key features of Nexo will be implemented in smart contracts on the Application and on the Ethereum blockchain platform. The nature of smart contracts makes them difficult to change and to fix bugs, improve performance, or add features and functions. ICOs suffer from their own success nowadays. It is the same with this ICO, If you do not participate in the pre-sale, you have a chance that you cannot participate in the sale at all. There are rumours that the crowdsale will not be held due to the overwhelming popularity.. Experts predicted that the biggest disruption that blockchain technology would offer would be in the Fintech industry.. we think they are right. Nexo’s solution would certainly help us when investing in promising ICOs.. and if it helps us.. we are certain it would help countless others. There is only one company offering loans based on cryptoholdings right noow and that is SALT, but their offerings are not instant.. it can take up to 2 weeks to get a loan. Imagine… SALT presale price was 0.5 USD.. they are now trading at 4 USD..